This sky map shows where to look to see the planets Venus and Saturn during the week of Nov. 8, 2010, when they rising before dawn in brilliant splendor. Venus and Saturn, two bright planetary gems of the sky, hadbeen hiding from skywatchers in recent months, but they have returned with flairjust ahead of the rising sun. In the complicated dance of the planets, both planetsappear from Earth to have moved west of the sun and both are now "morningstars" in the predawn sky, weather permitting. 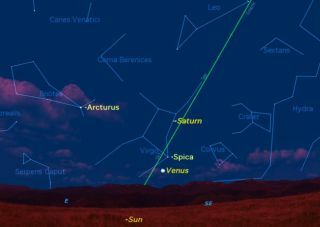 This sky map shows where to look to see Venus and Saturnin the early-morning hours. Even the most avid watchers of the sky probably haven?tseen either of these planets for a couple of months. Both have been hidingclose to the sun in our sky, but in very different locations. The planets rarely align exactly, but Venus was only 6degrees south of the sun at that time ? for all intents and purposes, totallylost in the sun?s glare. For comparison, the width of your fist held at arm'slength takes up about 10 degrees of the night sky. Saturnis a different story. On Oct. 1, it passed almost behind the sun, in what iscalled a "superior conjunction." It was only 2 degrees north of thesun on that date. To find Venus and Saturn, go out about half an hour beforesunrise any day this week and look a bit south of east. If your skies are clear, the most obvious thing you willsee will be brilliant Venus low on the horizon. Through binoculars or a smalltelescope, Venus will appear as a tiny slender crescent, since it is stillalmost completely back-lit by the sun just below the horizon. About 5 degrees (one binocular field) above Venus is thefirst-magnitude star Spica in the constellation Virgo. About 12 degrees (twobinocular fields) above that is Saturn. If Saturn looks a bit brighter than when you saw it last,you?re not mistaken. Saturn?s rings, which have been almost edge-on to theEarth for the last two years, are now starting to tilt toward the Earth, andthis has a striking effect on the planet's brightness to the naked eye. If you have access to a small telescope, take a look atSaturn. Its magnificentrings have now opened up so that it looks its old self. Skywatchers should also look for the moons nearby Saturn.Titan, Saturn's largest moon, is visible in even the smallest telescope, andfour more moons can be seen with larger amateur telescopes: Rhea, Dione, Tethysand Iapetus. Use a planetarium program on your computer to identify them. Both Spica and Saturn are of first-magnitude brightness,but noticeably dimmer than the star Arcturus in the east, and much dimmer thanVenus. Venus and Saturn will grace our morning sky for most ofthe winter months, but this week is your first chance to welcome them back. This article was provided to SPACE.com by Starry Night Education,the leader in space science curriculum solutions.